Founded in 2004, Paige jeans are all about fit. In fact, the brand’s namesake, Paige Adams-Geller, was a well known fit model before starting her denim line. Still one of the leading brands in the industry, the brand now has launched men’s (worn notably by Bradley Cooper) and more offerings than just denim. That said, their denim line is still fresh with prints and interesting cuts like the Nellie Jeans. The perfect 2019 jeans. I love the high rise, wash, and light distressing. With Adams-Geller’s past as a fit model, fit is a huge focus for the brand. In my own experience — and after in depth research of their online reviews — Paige almost always fits true to size and is praised for their comfort and for not stretching out. Part of this has to do with their signature fabric, called TRANSCEND fabric. It is a blended, lightweight fabric that Paige mentions all the time. Since Transcend is quite stretchy, you could size down if you wanted a tighter fit…just sayin. There are a few jeans in the 2019 collection that still use traditional denim. Just keep your eyes peeled when shopping, as Paige always puts Transcend front and center when they use it. Do Paige Jeans Stretch Out? Paige’s denim definitely has good stretch to them. They will form to your shape and hold you in. As I mentioned above, with the introduction of their TRANSCEND fabric, this is all offered in a buttery soft feel. One huge perk of the Transcend fabric is that it keeps its shape, even after the jeans age and have been worn many times. Paige jeans also tend to hold their color very well. One thing to now it that dark washes hold their color better as they contain less cotton. If you are looking for a dark blue or black with longevity, these by Paige are the best. Here’s is a little insight into what makes each pair of Paige’s jean special. Pregnancy is a time when you just want to be as comfortable as possible and the TRANSCEND fabric by PAIGE is sure to do that. These are a classic black with some distressing that’ll keep you on trend during those expecting months. 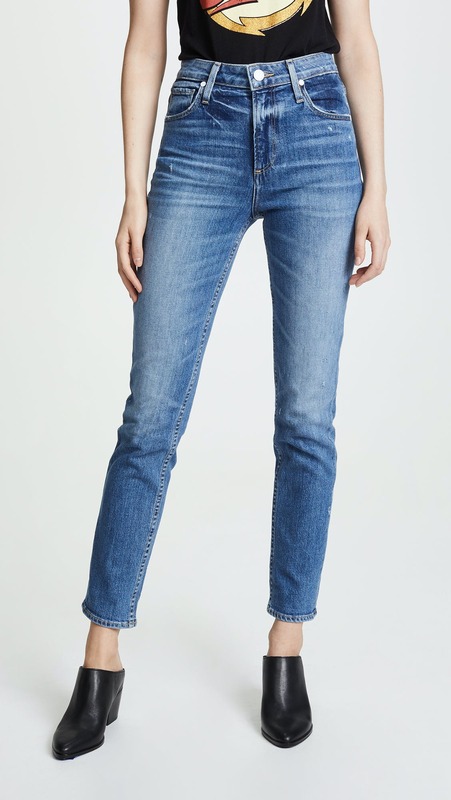 These ankle length jeans are simple and elegant, with the perfect cropped ankle for Spring and Summer. The ‘Sarah’ was the original skinny jeans that Paige offered and it is still just as popular and updated over the seasons. If you are looking for a skinny that is more classic and that is not super skinny, but still offering a slim silhouette, this is the style for you. They are cut slim at the waist and slim all the way down to the calves just like a classic skinny, but are cut with a slightly wider hem than the skinnies of now. This offers balance to the overall style. Being one of the original skinny styles, the ‘Skyline’ is offered in washes that are just as classic with choices mostly in clean washes of dark blues and blacks. Though Paige does offer them in the occasional distressed as well. Being one of the original skinny styles, the ‘Sarah’ is offered in washes that are just as classic with choices mostly in clean washes of dark blues and blacks. Though Paige does offer them in the occasional distressed as well. These might be my favorites from Paige’s entire women’s line. The vintage wash and look is so chic — and the piping detail adds a subtle, fashionable touch. Paige is all about the super comfortable, super sleek essentials, and their Margot jeans are no exception. A deep black wash with comfortable and fit you will love, these are the perfect black jeans. Reminiscent of the ’90s with their higher rise and slouchier fit, these will become your new go-to boyfriend jeans once you get your hands on them. Paige’s boyfriend jeans in a midrise, shown in their dark “Rada” wash and transcend blended fabric. The most popular style offered by the brand, the Paige ‘Verdugo’ Ankle is a medium rise, skinny cut that is slim throughout the whole leg offering a sleek silhouette. It is also offered in multiple lengths like longer lengths and petites to ones that are cropped and hit you just right at the ankles. Along with being offered in their signature TRANSCEND fabric, the Verdugo is also offered in more classic denim fabrications that are heavier in cotton for ones that prefer more rigidity to their jeans. When it comes to washes, there is no wash that that their most popular style has not touched. From whites and vintage blue inspired washes to the classic clean blues and blacks, the Verdugo is a style that is offered in it all. PAIGE is all about a timeless classic. The Nellie is a chic new style that you can dress up or down. With it’s clean lines, they will go with everything and one that you can even wear to more upscale occasions. A classy pair of bootcut jeans in Paige’s super comfortable TRANSCEND fabric, these are the essential business casual pair of jeans. Thought we wanted this review to be focused on Paige’s women’s line, a few readers emailed looking for men’s suggestions. These are really the essential black skinny jeans for any guy living in 2019. They are super comfortable, have a slimming cut, and are on the affordable side of premium men’s denim. Here is another choice for men — the Federal are a relaxed fit medium rise made with the Trandscend fabric Paige is famous for. This just means they are stretchy and comfortable but wont lose their size. Paige is similar in price, size, and aesthetic to Rag & Bone and Citizens of Humanity. Below, I’ll show you a few jeans from those brands and how they are similar to Paige. In style and fit, the Chrissy are very similar to some of Paige’s jeans, like the Hoxton and Verdugo. The price is slightly more expensive, so consider yourself warned! Rag and Bone vs Paige DenimI choose a fun, unique pair of Rag and Bone’s here, but their whole collection fits very close to Paige’s jeans.